APA Rated plywood and OSB panels use only moisture resistant adhesives and therefore are exempt from U.S. EPA and California formaldehyde regulations due to their very low emission rates. Formaldehyde occurs naturally, and it’s all around us. Humans, plants and animals produce formaldehyde as a normal part of living. Recent news reports highlighted concerns about formaldehyde concentrations in imported composite wood flooring. 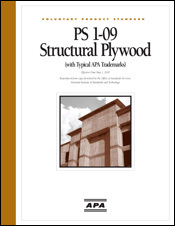 This APA Technical Note: Formaldehyde and Engineered Wood Products, Form J330 addresses how plywood and OSB manufactured to U.S. Product Standards PS 1 and PS 2 have low formaldehyde emission levels and meet or are exempt from the leading formaldehyde emission standards and regulations. 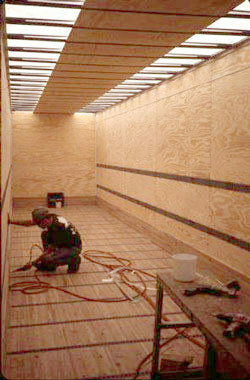 Structural wood products such as plywood and oriented strand board (OSB) are manufactured to meet stringent product standards, including Voluntary Product Standard, PS 1-09, Structural Plywood, Form L870 and Voluntary Product Standard, PS 2-10, Performance Standard for Wood-Based Structural-Use Panels, Form S350. Because wood products produced under these standards are designed for construction applications governed by building codes, they are manufactured only with moisture-resistant adhesives that meet Exterior or Exposure 1 bond classifications. These adhesives, such as phenol formaldehyde and diphenylmethane diisocyanate (MDI), are chemically reacted into stable bonds during pressing. The final products have such low formaldehyde emission levels that they easily meet or are exempt from the world’s leading formaldehyde emission standards and regulations. On July 27, 2016 the EPA released their prepublication version of the rules for “The Formaldehyde Emission Standards for Composite Wood Products Act of 2010.” This national “formaldehyde act” establishes formaldehyde emission standards for composite wood panels and finished goods made with these products. Composite panels are defined as particleboard, medium density fiberboard (MDF) and hardwood (decorative) plywood. One year after the rule is published, composite wood products and finished goods that are sold, supplied, offered for sale, manufactured, or imported in the United States will need to be labeled as TSCA Title VI compliant. 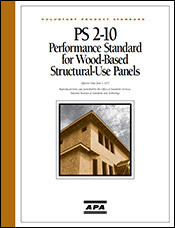 With respect to the structural panels made by APA members, the “formaldehyde act” is technically consistent with the Airborne Toxic Control Measure (ATCM) for composite wood issued by the California Resources Air Board in that structural engineered wood products that are exempted from the scope of the act. For more information on the EPA rules, visit the EPA US Environmental Protection Agency. This standard specifies a 0.20 ppm emission limit for (non-structural) plywood using the ASTM E1333 method. Because of its extremely low formaldehyde emission levels, phenolic-bonded structural plywood is exempt from the testing and certification requirements of the standard. While there is no specific limit HUD requirement for OSB, it has been well accepted that the stated exemption for structural panels that use phenolic adhesives is applicable to OSB products meeting Voluntary Product Standard PS 2. This regulation was developed by a division of the California EPA and took effect in 2009. The scope of the standard covers particleboard, MDF, and hardwood plywood. The demonstrated low emission levels of the engineered wood products led the CARB regulation to explicitly exempt structural plywood specified to PS 1, structural panels specified to PS 2, OSB specified to PS 2, structural composite lumber specified to ASTM D5456, structural glued-laminated timber specified to ANSI A190.1, and prefabricated wood I-joists specified to ASTM D5055. Under the Japanese Agricultural Standards (JAS), panels meeting the most stringent formaldehyde requirements (F★★★★) are required, using test method JIS A 1460, to have average emission levels below 0.30 mg/l. PS 1 and PS 2 panels easily meet F★★★★ requirements. This formaldehyde regulation for wood panels is widely considered one of the most stringent in the world. Formaldehyde is a simple chemical made of hydrogen, oxygen, and carbon. It occurs naturally and is the product of many natural processes. It is made by our bodies and is in the air. Plants and animals also produce formaldehyde. It is in many fruits and vegetables and is a byproduct of cooking certain vegetables, such as Brussels sprouts and cabbage. This chemical breaks down quickly and is metabolized to simple carbon dioxide. Our bodies readily break down the low levels to which we are exposed everyday. Formaldehyde is also a product from combustion associated with the burning of kerosene and natural gas; automobile emissions, and cigarettes. It is an important industrial chemical used in the manufacture of numerous consumer products, including permanent press fabrics and even toothpaste. In 2009, California's Air Resources Board (CARB), a division of the California EPA, enacted regulations to reduce formaldehyde emissions from wood panels and products made from wood panels used in the state. The regulations established the most stringent formaldehyde emission limits on wood products in the United States. The measure requires that wood panels and products manufactured from wood panels be certified by a "third party" laboratory approved by the CARB as meeting California's emissions requirements. Panel manufacturers, importers, distributors, fabricators and installers can all be held responsible for assuring that their products comply. The new emissions limits were fully implemented in 2012. Panels certified to U.S. Voluntary Product Standards PS 1 and PS 2 are manufactured with moisture resistant adhesives and regardless of whether the panels are used in construction or for finished goods like cabinets or furniture are exempt from the CARB regulations. APA has cautioned the marketplace to beware of imported panels from China or other locations that are either unmarked or improperly even fraudulently, labeled. 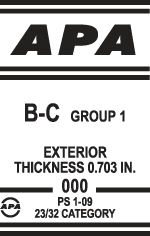 APA conducted tests to benchmark the adhesive, mechanical and connection properties of uncertified Chinese plywood relative to North American plywood certified to U.S. Product Standards PS 1. The results indicated that the imported uncertified plywood panels exhibited inferior mechanical and connection properties and had excessive levels of formaldehyde. The adhesives used in the imported plywood were not moisture resistant and emitted high levels of formaldehyde that would exceed CARB limits. View the APA Product Advisory: Imported Hardwood Plywood vs. Domestic PS 1, Form SP-1136. Green building specifications often include preferences for wood products provided they are manufactured with adhesives with very low formaldehyde emission levels or are made with adhesives that do not include urea formaldehyde. APA Rated panels meet both of these requirements and, therefore, may gain preferential recognition under green building specifications. 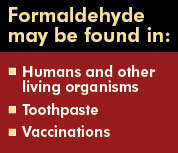 Formaldehyde is a ubiquitous molecule, commonly found in small amounts in the environment. It's a by-product of incomplete combustion, present in car exhaust and cigarette smoke. It's also a naturally occurring biological molecule found in living organisms. Because it's a one-carbon molecule, it's used as a building block to create larger biological molecules. It naturally breaks down in the atmosphere, as well. Formaldehyde is used in numerous ways in manufacturing. It's used in the production of plastics, vaccines, personal care products – and even in the production of paper money. Phenolic adhesives, used extensively in the engineered wood industry, is made by reacting formaldehyde with phenol.When wood products are hot pressed it creates an irreversible reaction called "curing." Once cured, phenolic adhesive is a solid polymer that is highly durable and moisture resistant. It has properties completely different from formaldehyde.